A top exec from Tencent’s mobile chat app WeChat has revealed plans on opening an office here in the Philippines to better serve it ever-growing consumer base in the island nation. Justin Sun, director of international WeChat operations, said that the office will primarily be for marketing, potentially opening the doors for brands to engage 300 million users it’s amassed in just two years globally. The office could also be tapped by WeChat to localize its promotion possibly with local ambassadors. 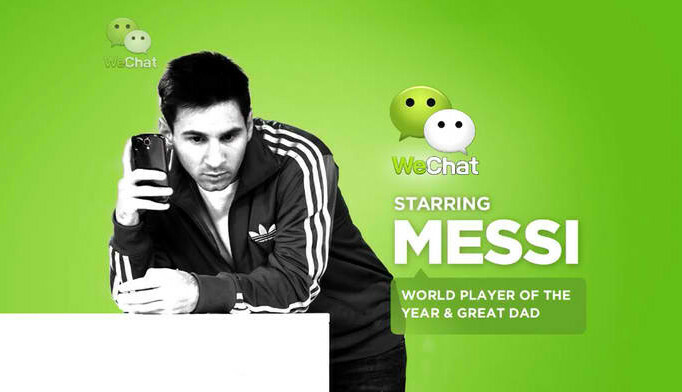 Reports say that Tencent has earmarked up to $200 million for marketing overseas this year including ads starring football star Lionel Messi (pictured) that ran region wide. meanwhile, the company’s headquarters in China will remain as WeChat’s research and development hub. “The Philippines right now is our most important market in Southeast Asia,” Sun said in a report from ABS-CBNnews.com. Details are tight under wraps but Sun that they are currently in talks with companies like ABS-CBN Corp. and Jollibee Food Corp Sun noted WeChat also plans on exploring business partnerships. WeChat’s current solid partnerships are with telco companies, with both Smart Communications and Globe Telecom launching separate mobile deals which typically includes free unlimited WeChat service. Hong Kong's largest sushi chain has launched a new TVC which zeroes in on how sushi makes everything better. Kind of like a box of..